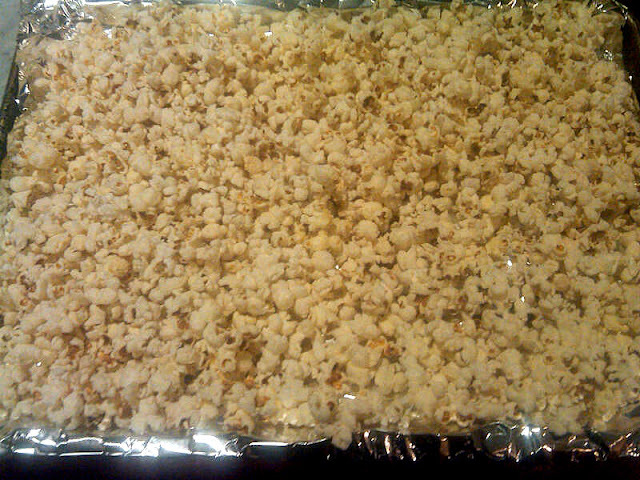 Once I read in Monday's New York Daily News that popcorn is the new health food, I immediately made some -- and then doused the whole batch in sugar syrup. Was that wrong? Health benefits aside, I wanted to recreate the old-fashioned popcorn balls of my youth. Making popcorn balls is easy; the only challenge is working forming the popcorn into balls without burning one's hands, as the sugar syrup can be quite hot. Run your hands under cold water for a minute before beginning. This is a wonderful project to do with children; when my daughter turned nine, we made popcorn balls at her birthday party -- a fun and delicious activity. ...the sugar syrup heats to 250 degrees, a painfully slow process until the very end when the temperature rises so quickly, you're hardly ready for it. 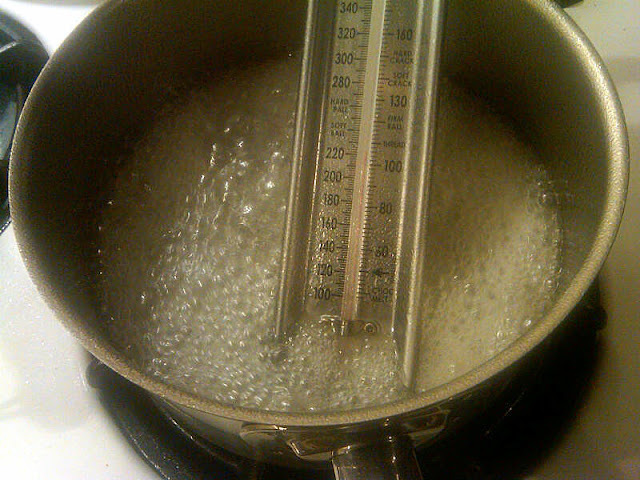 You don't need a candy thermometer (you can test the syrup by dropping a bit in a glass of cold water; it's ready when it forms a hard ball) but it does make things easier. When the syrup reaches 250 degrees, take it from the fire and drizzle it on the popped corn. I spread mine in a hotel pan -- next time I'll use a bowl and stir with a wooden spoon to better distribute the liquid sugar. The recipe is from the c. 1960s Better Homes and Gardens New Cookbook. The first (and last) time I tried making popcorn balls it was not pretty. I didn't have a thermometer then and cooked the sugar WAY too long. The few I did get formed into balls could likely have been considered lethal weapons and the clean up was awful. Soaking a large pot with brittle-ized popcorn stuck all over the inside still haunts me - what a mess! Too funny, Tug's Girl! I have a couple of sugar disasters myself, like the time I put a spoon of cooked sugar in my mouth (left over from making lollipops) and glued my jaw shut and we were headed out to a dinner party! A lot of very hot coffee solved the problem. And I once discarded a pan that I thought was too daunting to clean after yet another disaster. Though I've read that one needs to reheat the mixture to convert it back to liquid to make clean-up easier. As a matter of fact, I'm pretty sure Julia Child said that was her preferred method of cleaning the pan in the episode of "The French Chef" where she made the Yule Log. 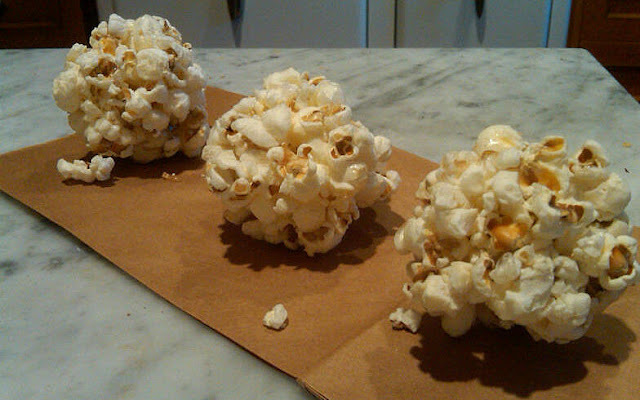 I always thought popcorn balls were way too much work but just loved them if someone else made them. (My mom made them when I was young as in old-time for Halloween hand-outs) When I discovered making microwave caramel corn at a tupperware party. . . (now how many years ago could that have been!!??). . . I knew that was my substitute for popcorn balls with NO guilt!! Love the photos, though. Makes me hungry. 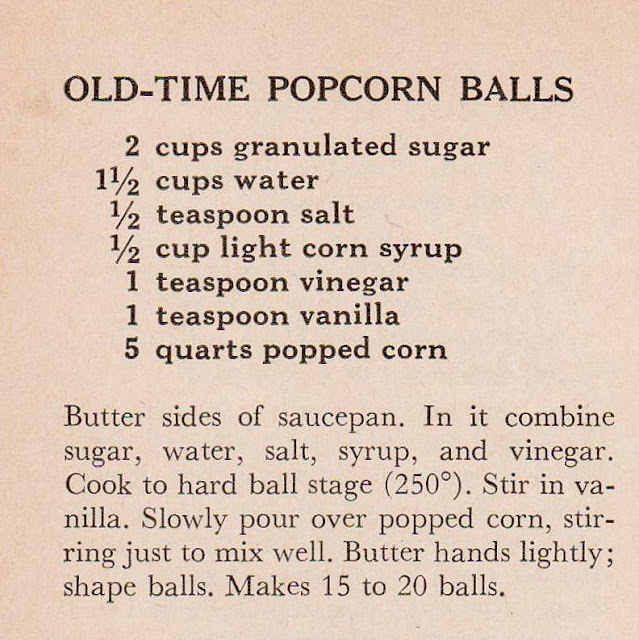 I think I will just go and make some old-time popcorn sans balls?!? Kevel -- They are a lot of work, but someone has to do it,right? Thanks for writing! Mmm - as I read this post I could smell them! ;) I agree with kevel88 - too much work for me but will happily gobble them down if someone else would make them!